Villa Carlotta is a four bedroom villa in the Callao Salvaje resort in Tenerife. 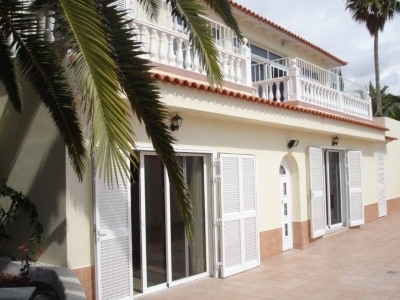 The villa sleeps up to 8 people and enjoys a sea view. The living area is open plan with comfortable seating and a dining table and chairs for 8 people. There is satellite TV including English channels and free wifi internet access. The kitchen is fully equipped including a dishwasher. There are three bathrooms including one ensuite. The bedrooms consist of three double bedrooms and one twin bedroom. The villa has a private heated pool amidst spacious grounds with gardens and a sun terrace which is secluded and not at all overlooked. There is a pergola offering shade for an alfresco dining area with patio table and chairs, along with a barbeque.